I came across Father's Country Hams while browsing through a certain Home Shopping Network site. They call themselves "Kentucky's Finest Eating" and seriously, they've got some gourmet bacon that I just haven't seen anywhere else. If you don't happen to live in Kentucky, they do deliver via UPS. This just looks scrumptous. Father's Piglets "The Ultimate Bacon Snack" is tasty bits of dry cured bacon that has been hand cooked with brown sugar and chopped pecans and baked until they are golden brown. Eat them right out of the bag! Could these be made at home? Probably, but I'm too lazy and these don't really break the bank. Alright, now are you ready for this? How about some Father's Country Vanilla Bourbon Bacon! Three great things - Bourbon, Vanilla, and Bacon! Only $7.50 a pound. Father's Blueberry Cinnamon Bacon is dry-cured,smoked with real hickory and hand-rubbed with specially created blueberry-cinammon rub. Father's Peach Cinnamon Bacon has the flavor of fresh peaches, hickory smoke and a glaze of brown sugar. Wow. I've yet to order bacon over the internet but I think this is gonna get me to do it. 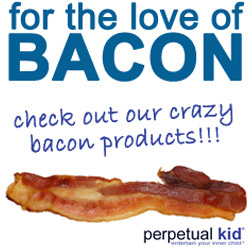 They also have lots of other flavored bacon, in addition to regular bacon flavored bacon, if you're into that sort of thing. Holy Jesus. That bacon looks amazing. Let's put in a bulk order. I am ready, let's try them all! We can have a bacon tasting party at my place.